Welcome to the Blue Damsel Lodge, Montana’s premier luxury fly fishing lodge. Located on legendary waters of Montana’s Rock Creek surrounded by the Lolo National Forest of western Montana, you will stay and dine in rustic luxury while fly fishing the unmatched diversity of the four different trout streams of “A River Runs Through It” country. At Blue Damsel Lodge, you will enjoy truly the finest Montana fly fishing trips around. 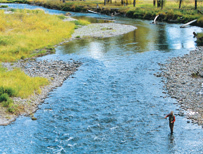 Our prime location 40 minutes from Missoula, Montana allows a wide range of fly fishing options and flexibility. This simply maximizes your chances of enjoying great, non-crowded fly fishing on your trip with a lot of very different, trout-rich water to see and fly fish with the help of experienced, professional Montana fly fishing guides. Please browse through our website to get an idea of the great experience you are in for and what to expect regarding fishing, lodge life, cuisine, customer service and other activities for off days or the non-angling companion. You will find a wealth of information about fly fishing Rock Creek, fly fishing the Big Blackfoot River, fly fishing the Bitterroot River, fly fishing the Clark Fork River and fly fishing Georgetown lake. You will also find helpful information about the different trout species that we can fly fish for including wild Montana Rainbow Trout, wild Brown Trout, native Westslope Cutthroat Trout and native Bull Trout. Our Montana fly fishing Photos and comments from guests offer proof that this is the true Montana fly fishing adventure that you have been dreaming about. Please contact us anytime for details, availability or to talk about fly fishing under the big sky of western Montana.